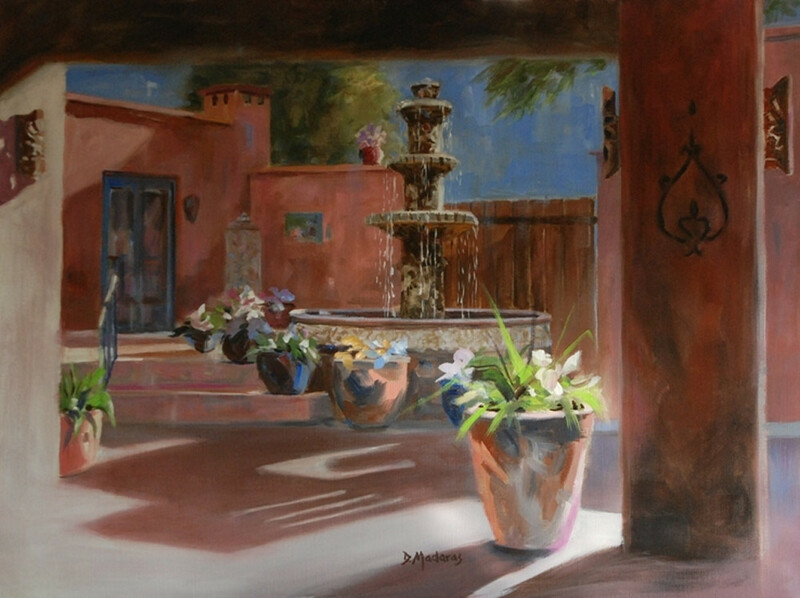 Moonlit Courtyard - This lovely southwestern patio is located at the historic Rex ranch in Amado, Arizona. The guest ranch closed several years ago and currently efforts are under way to restore and reopen it. Our Canvas Reproductions (available in 6 sizes) are giclees – a very high quality reproduction that is approved for color and quality by the artist. The image wraps around the sides of the canvas (mirror image) so you can hang it unframed or framed. Our Prints can be selected in 5 sizes. The two smaller print sizes include a mat with the purchase (mat dimensions are 14x11" & 20x16" respectively). Other sizes do not include a mat and ship rolled up. Each print is a high quality reproduction with color approved by the artist.